Craig Taylor is a journalist and photographer based in the Orkney Islands, off the north coast of Scotland. Over the last 20 years Craig has built up an extensive image library which has attracted interest from a broad range of clients. One area which Craig has extensive experience in, is aerial photography. He has taken aerial photographs of Orkney from aircraft over many years, as well as using kite aerial photography which captures the islands from very unusual angles, which are unable to be photographed any other way. These Orkney aerial photographs have been so popular that his first book entitled simply 'Orkney from the air' sold out in hardback soon after being published in 2009. The book then sold out in softcover. 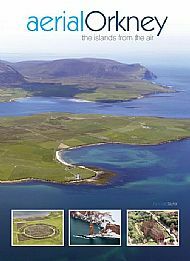 AERIAL ORKNEY, a brand new 'magazine style' publication (Launched May 2014) featuring the islands from the air, which features archive aerial views and brand new, never before published images was self published by Craig.